Flash in December 2012, he is such a BIG gorgeous boy. He is already over 15hh at 2 years old, he’s gonna easily make 16hh I think. 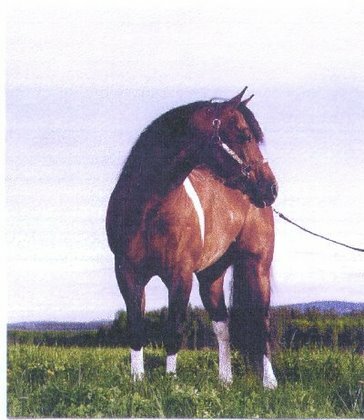 Here’s Flash with his buddy Beau, a stallion 2 years older than him, and he’s already the same size. 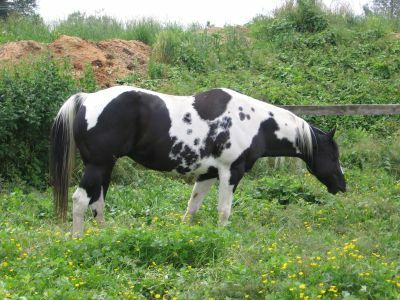 Here’s Flash out in the pasture in June 2012. He’s a hard one to get a picture of because he keeps walking up to me. This is Flash’s 3rd ride. He is so naturally athletic that he is doing cross overs on his own! Can’t wait to really see what he’s got next year. Flash’s first ride. He took everything very well and did good. 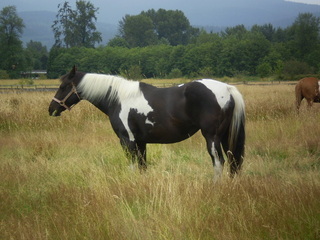 He had 4 rides and now has been turned out on pasture until the fall. Myself on Joker snubbing Theresa on Flash for his first ride. The lookalikes make a nice pair of horses. Flash is such a beautiful mover, he just floats! 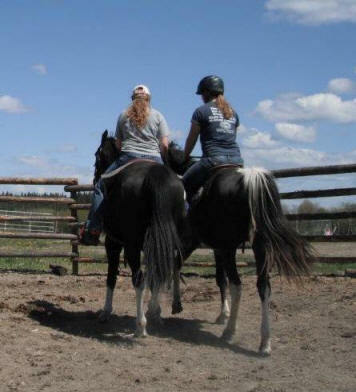 Here he is with the saddle on for the first time, May 2012. 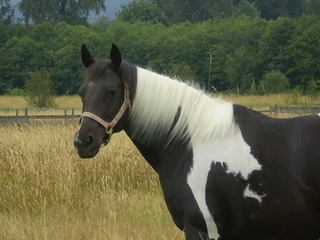 Here is Flash with his look alike, my gelding Joker. Winter of 2011/12. 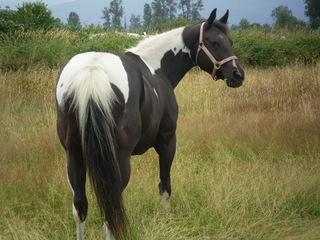 Flash in the muddy corral during a wet spell in July 2011. 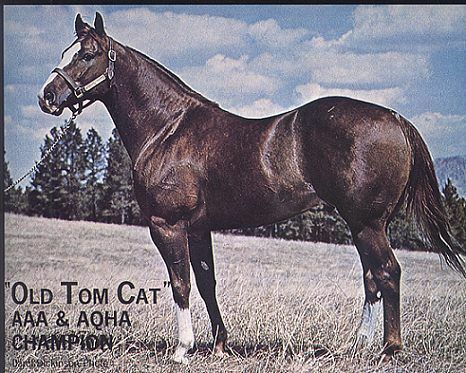 Flash is a grandson to the great Bonnington Express, also he carries the bloodlines of these greats: Sky Bug Bingo, Sonny Dee Bar, Otoe, Old Tom Cat, and Par Three to name a few. We look forward to standing him as one of our stallions in the years to come. 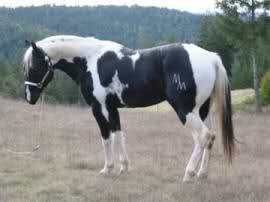 He doesn’t have alot of white on him, but he sure is flashy looking, and will throw all kinds of colour. 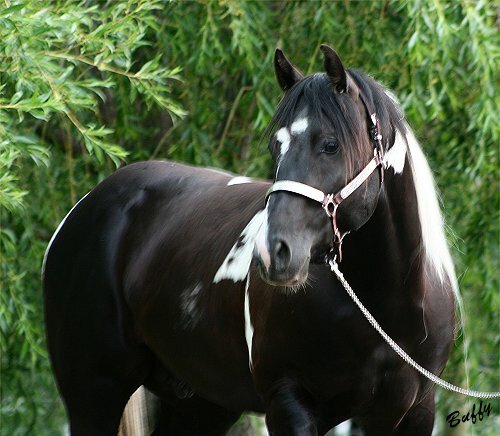 Both Flash’s dam and sire are also double homozygous for the black and tobiano genes. Pictures of Flash after a bath at his old owners place. 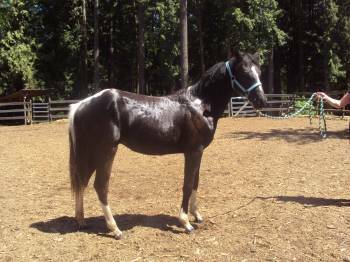 Sky Bug Bingo (1972 Sorrel Tobiano. 10- 0- 1- 1, $720.90. 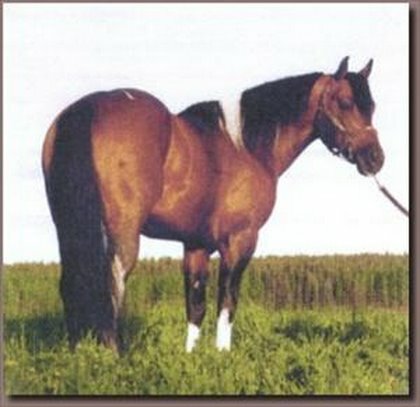 53-H, 81-P. APHA Supreme Champion. 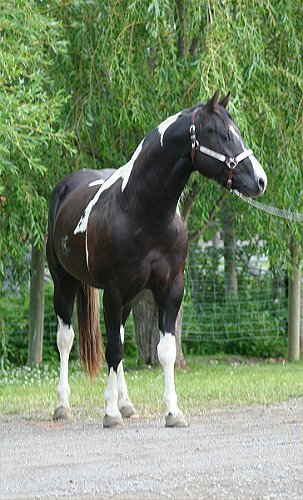 APHA Champion. 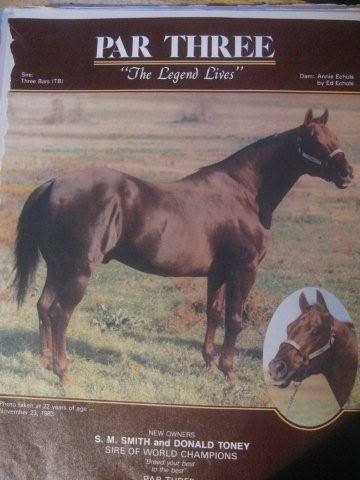 National Champion Get of Sire. Resv. 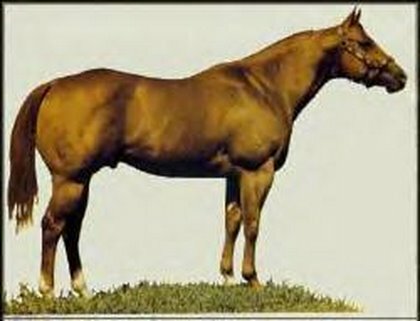 National Champion Get of Sire. 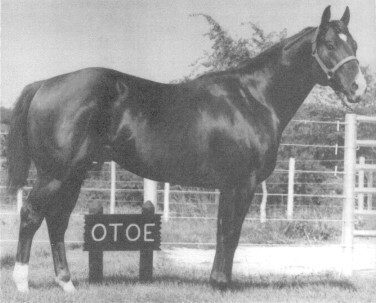 Superior Halter. 16- Cutting, ROM. 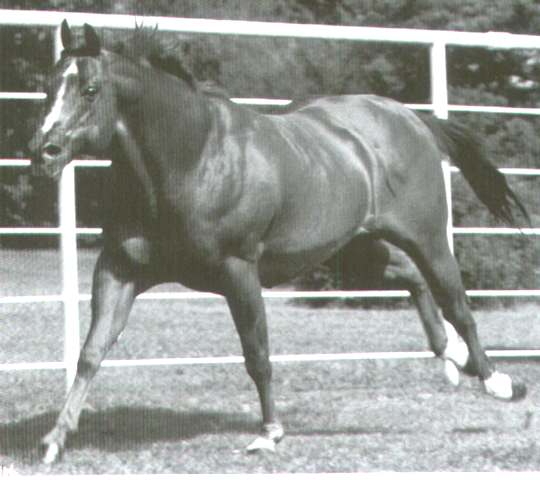 15- Western Pleasure, ROM. 14- Hunter Under Saddle, ROM. 13- Reining, ROM. 12- Racing, ROM. 11- Barrel Racing, ROM. 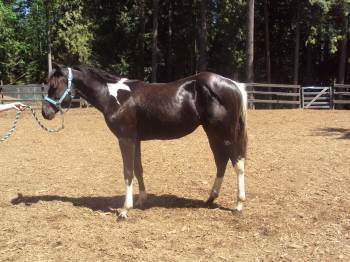 2000 Double Homozygous Black and White Tobiano. 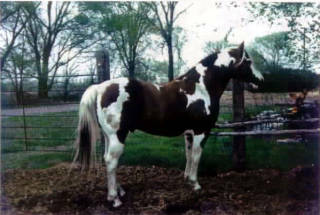 1981 Sorrel Tobiano. 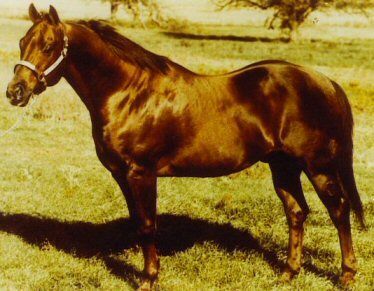 Western Pleasure Points Earner.